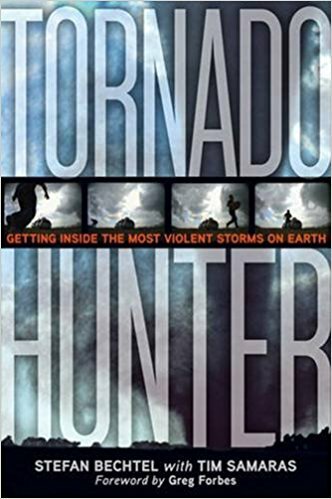 TORNADO HUNTER: Getting Inside The Most Violent Storms On Earth, is a sort of science action adventure, taking the reader along on a hair-raising journey into one of nature’s most awe-inspiring and deadly phenomena. The book tells the story of boy genius Tim Samaras, who never went to college but has become one of the most persistent and successful tornado researchers in the world. Tim’s ingenious “turtle probes” have extracted more data and pictures from the tornadic core than anyone else, including researchers with advanced degrees in meteorology and engineering. Tim’s probes, which look like a little UFO about the size of a manhole cover and are painted bright orange (for easy recovery in the rubble-strewn aftermath of a tornado strike), are fashioned of hardened steel and aerodynamically shaped to withstand the otherworldly winds at the cyclone’s core. They are embedded with meterological equipment and an array of “bullet cams,” or tiny hot dog-shaped video cameras. The goal is to deploy these probes directly in the path of an onrushing tornado at extreme close range, a task so dangerous and difficult that many severe-storm experts had concluded it was impossible. But Tim was only emboldened by the experts’ scorn and he kept trying, year after year, until one afternoon in the summer of 2003 he deployed a probe directly in front of an F4 tornado which wiped the town of Manchester, South Dakota completely off the map. But before it did, Tim’s probe scored a dead-on hit, capturing volumes of data from the very core of a tornado, including the most extreme pressure drop ever recorded. It was a feat akin to taking the temperature of a T. Rex, and it landed Tim Samaras in the Guinness Book of Records. Tornadoes are phenomena of superlatives. They are so strange they “don’t even look like they belong on this planet,” one veteran storm-chaser says. The wind speeds inside tornadoes have been measured at 318 miles an hour, enough to lift a fully-loaded freight car and throw it eighty feet through the air. It’s actually possible that the highest wind velocities have never been measured — a theoretical physicist has recently suggested that winds inside the tornadic core may approach the speed of sound — over 700 miles an hour. So why would anybody want to get so close to one you can almost taste it? Well, having been out there with these guys for two chase seasons while writing this book, I can say that there are a multitude of motivations. Tim Samaras goes out there season after season because he’s trying to measure and understand these ferocious freaks of nature, in order to help protect people in their path. Other chasers seem drawn to the sense of supreme aliveness that lies in that moment just before death. People like me just want to come face to face with The Mystery in its scariest and most numinous form, and live to tell of it. TORNADO HUNTER is the sort of book I always loved to read as a kid, and now love to write as a man. It’s a white-knuckle read, which imparts a surprising amount of knowledge, painlessly, along the way. What could be better? “This is it,” mutters Tony Laubach darkly. “This is the day somebody gets killed.” It’s 6:23 p.m. on Friday, May 23rd, 2008, and the Storm Prediction Center at the National Weather Service has just reported that yet another extremely dangerous supercell, which could spawn yet another extremely dangerous tornado, is bearing down on our location in the tiny town of Quinter, Kansas. It’s due to arrive in about sixteen minutes. Tony wrenches our storm-chasing vehicle back towards Interstate 70, intent on blasting a little ways west out of town so that we can observe whether this violently explosive storm system will give birth to a tornado without our getting killed by it.